Howard University shines in Amateur Tourney! Howard University students (Washington, DC) entered the East Coast Amateur Championships and amassed a record of 17 wins 2 losses and one draw. As a result, students from the famous institution garnered a number of prizes. "We knew that we would have done well, but we exceeded our own expectations. We have set ourselves a standard for the rest of the year and the upcoming tournaments." Vaughn Bennett has served as a mentor for the Howard players and describes the recent development as "historic." Travis Hoskins led the charge by winning the under-1800 section while teammate Emmanuel London took 1st in the under-1300 section with a 5-0 score. Tied for 2nd in the under-1300 section were Errol Daniels and Darius Lyles with 4 points apiece. Dr. Kimani Stancil took clear 2nd in the U2200 section with a score of 3½-1½while fellow experts David Paulina and Antoine Hutchinson tied for 3rd-5th with a score of 3. Vladimir Lipman took 1st in under-2200 with an undefeated 4-1. Cajun Chess was the chief organizer of the tournament. In an article date November 21st in the Howard Hilltop stated that the chess club will participated in the National Congress in Philadelphia next weekend and the Pan-Am Intercollegiate tournament in December. 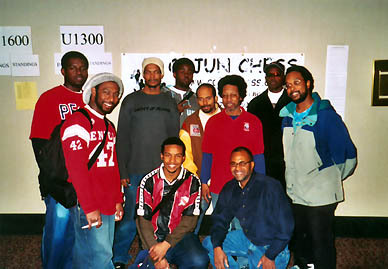 The Howard Hilltop, "Chess Team Blazes New Trail," 21 November 2003. The Chess Drum, "DC's Bennett continues to make good moves!" 28 February 2003. The Chess Drum, "Howard University on the Chess Map!" 1 December 2003. The Chess Drum, "Howard University hosts Homecoming Chess Festival!!" 15 October 2002.